José Carlos Martínez began his ballet studies in Cartagena, under Pilar Molina, continuing in 1984 at the Centre de Danse International Rosella Hightower in Cannes. In 1987, he won the Lausanne Prize and joined the Paris Opera Ballet School. In 1988, he was personally selected by Rudolf Nureyev to join the Ballet Company of the Paris Opera as a corps de ballet dancer. 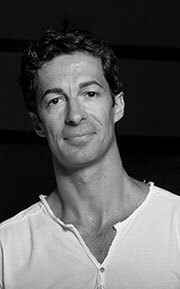 In 1992, he was promoted to Principal Dancer and won the Gold Medal in the International Competition of Varna. On 27th May 1997, he was appointed Etoile of Paris Opera Ballet, the highest category a dancer can rise to. Mr. Martínez has been celebrated for his choreography. For students of the Paris Opera Ballet School he created Mi Favorita (2002), Delibes-Suite (2003) and Scaramouche (2005). For the Paris Opera Ballet itself he created Paréntesis 1 (2005), Soli-Ter (2006), El Olor de la Ausencia (2007) and Les Enfants du Paradis. For the Shanghai Ballet he created Ouverture en Deux mouvements and Scarlatti pas de deux (2009), Marco Polo and The Last Mission (2010). For Compañía Nacional de Danza de España he has created Sonatas (2012), Raymonda Variations, Giselle pas de deux (2013) and Don Quixotte Suite (2015). He also created Resonance (2014) for the Boston Ballet. He is also behind the CND's first full-length classical ballet for 20 years: his own version of Don Quixote, which will be premiered at Teatro de la Zarzuela Madrid, on December 16th 2015.